England's Euro 2016 qualifier in Lithuania was marred by crowd trouble, with riot police required to quell skirmishes between rival fans. 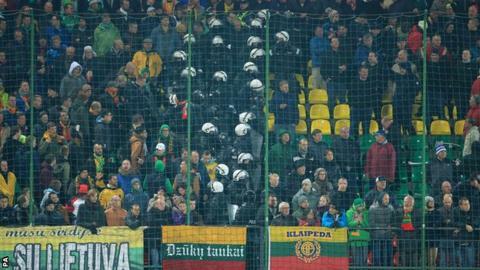 Fighting broke out in a stand behind one of the goals just before the match began in Vilnius. Local police quickly intervened, forming a barrier between fans to prevent the violence escalating. Some England fans appeared to have purchased tickets for sections of the ground designated for home supporters. "There have just been a few brief skirmishes between rival fans at one end of this tiny stadium where some England fans have posted themselves near Lithuania supporters. Riot police were quickly on the scene and have now formed a human barrier separating the two groups." BBC Radio 5 live reporter Alan Green reported he had seen missiles being thrown by fans. England won 3-0 with goals from Ross Barkley and Alex Oxlade-Chamberlain, either side of an own goal from Lithuania keeper Giedrius Arlauskis. Victory means Roy Hodgson's side have won all 10 of their qualifying matches for next summer's European Championship in France.